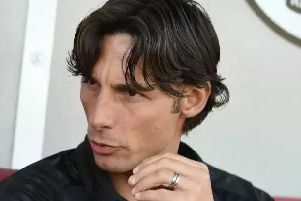 I don’t imagine new Crawley Town manager Gabriele Cioffi was totally unaware of the pitfalls he might encounter in a League Two season but the proceedings at New Lawn in his first away game would have made many of them plainly obvious. None of the 147 travelling Reds’ fans was at all surprised by the setback they witnessed at this footballing outpost. The fact that Forest Green Rovers’ ground is exposed on a hill top and the persistent rain was accompanied by an unseasonably low temperature simply highlighted the unfortunate scenario. It might all have been so very different. I wonder how many times I have expressed that sentiment in this column over the seasons. Home ‘keeper Robert Sanchez made four saves in the opening 20 minutes as Crawley made the fast start that has become part of their game. They didn’t score, however, and the strike force needs to be boosted. Ollie Palmer frequently played too deep as service from the midfield was lacking and whilst Panutche Camara’s skills again baffled his markers, he failed to conjure up even a single attempt on goal. Crawley’s shortcomings are in a midfield missing both the injured Jimmy Smith and the out of favour Josh Payne. Too much reliance is placed on Felipe Morais whose undoubted flair was submerged by overwork. At the back the defence was generally sound but their formation for the next game will be problematic. Romain Vincelot has not yet returned from injury and has now been joined by Mark Connolly who was taken out of the game after only ten minutes by a nasty, but unpunished, challenge. His replacement Joe McNerney will sit out the next game serving a suspension following his late dismissal for two cautions both, I suspect, borne out of sheer frustration. Glenn Morris was again absolutely brilliant while the officials attracted much disparagement for some decisions that were, shall we say, uneven. Some things simply never change. We learned more about Forest Green. They are unbeaten because their compact defence is well-drilled and they do not readily concede ground and Reds could not keep possession. Rovers have won only rarely because their finishing is simply pitiful. I cannot fathom why they let Christian Doidge go out on loan. Reuben Reid’s goal was both clearly offside and took a wicked deflection although it earned the narrow win that overall Forest Green deserved. For me the biggest disappointment came on the hour mark. At the culmination of a heartfelt round of applause for the late Gill Courtnell (which was well supported by the home fans) Luke Gambin unleashed a drive towards the top corner of Sanchez’s goal only for the Brighton loanee to ignore the spirit of the moment and make a fine save. It’s back to the drawing board for Cioffi as he re-jigs his line-up for the visit of Yeovil Town.